Flooding in Iowa City’s City Park, June 2013. City Park, just north of the University of Iowa campus in Iowa City, has seen a lot of floodwaters go by. Recently City Park was the site of a different kind of flood event — a press conference featuring U.S. Representative Dave Loebsack of Iowa’s second district, discussing his proposed legislation to create a national flood center. On August 6, Loebsack stood on the banks of the Iowa River near the UI’s Beckwith Boathouse and explained his plan for the national flood center, and his desire to be proactive in the face of future flooding. “I think there’s a lot more seriousness of purpose about doing what we can to make sure that we understand why floods occur, to make sure that we have the kind of recovery that we need from floods and to make sure we do what we can to prevent floods in the future,” Loebsack said (quoted in the Iowa City Press-Citizen). 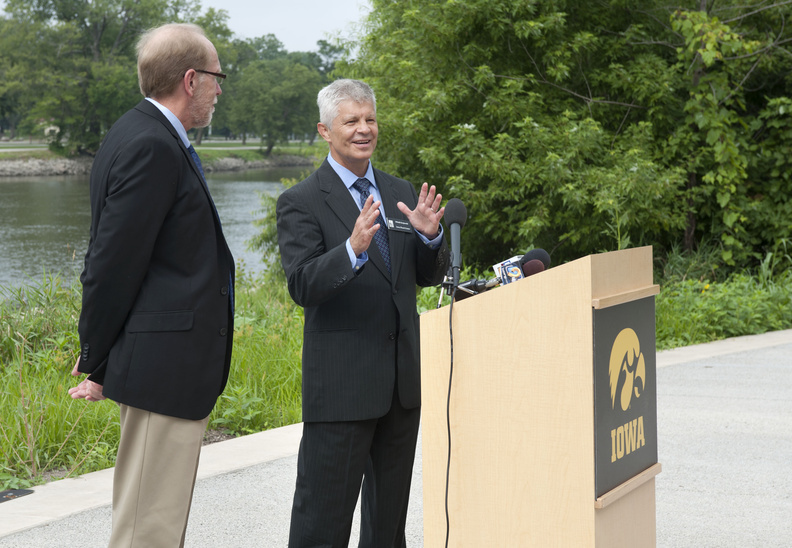 U.S. Representative Dave Loebsack (left) and IFC Director Witold Krajewski discuss the proposed national flood center at a press conference in Iowa City on August 6, 2013. Loebsack’s legislation, the National Flood Research and Education Act, would bring together the resources of federal and state agencies with the expertise of academic experts, such as those at the Iowa Flood Center. The proposed $10M initial appropriation for the center would continue for at least five years. Loebsack submitted similar legislation two years ago, which failed to pass. Since then, however, Superstorm Sandy has wrought havoc on the East Coast and numerous floods have occurred around the country, costing billions of dollars and taking more lives than any other type of natural disaster. Loebsack says he hopes his proposal will find a more receptive audience this time. Loebsack was joined at the news conference by Witold Krajewski, director of the Iowa Flood Center, as well as state senators Bob Dvorsky and Joe Bolkcom, and Johnson County Supervisor Terrence Neuzil. Speaking at the news conference, Krajewski said that an academically-based center can bring flexibility and creativity in response to complex problems such as flooding. “The center would bring together ideas and solutions from many disciplines and accelerate the process of building resilient communities,” Krajewski said in a Cedar Rapids Gazette story. The proposed national flood center would bring together agencies such as the National Oceanic and Atmospheric Administration (NOAA), the Federal Emergency Management Agency (FEMA), and the National Weather Service. Academics and scientists from around the country would also collaborate on research at the new center. Read more about Loebsack’s proposed legislation. As anyone in New Orleans would argue, a party just isn’t a party without the perfect band. That’s why Hancher is bringing the Preservation Hall Jazz Band—Hancher’s opening performers in 1972—back to Iowa for a series of seven free outdoor concerts for a 40th anniversary celebration. Named the Living with Floods project, the Hancher series is in keeping with the University of Iowa’s mission of teaching, research, and service and aims to provide services to communities throughout the state. The project will commemorate the fifth anniversary of the 2008 flood, celebrate progress made towards recovery, and raise awareness of strategies to mitigate floods as well as of the interconnectedness of our environment and watershed. Hancher will present free, outdoor performances by the Preservation Hall Jazz Band in the seven Living with Floods communities: Iowa City, Dubuque, Davenport, Cedar Rapids, Des Moines, Council Bluffs, and Muscatine. Living with Floods partners include the University of Iowa College of Engineering, College of Education, the Center for Global and Regional Environmental Research, and the Iowa Flood Center. Named for the esteemed music venue in the heart of New Orleans’ French Quarter, the Preservation Hall Jazz Band is a true national treasure. Hailed as “America’s Best Traditional Jazz Band” by All About Jazz, the group has been a driving force in American music ever since its inception in 1961, counting jazz royalty like Jelly Roll Morton and Louis Armstrong among its distinguished alumni. Now in its 51st year, this national treasure continues to honor the dirty rags, mournful blues, and laid back swing that form jazz’s legacy. The Iowa Flood Center mobile weather radar unit stationed at the Iowa City landfill. Photo courtesy of Aneta Goska, 5/27/2012. The Iowa Flood Center (IFC) got a scare over the weekend when fire broke out Saturday night at the Iowa City Landfill. One of the Iowa Flood Center’s four state-of-the-art mobile weather radar units, stationed at the landfill, is close to the fire still burning at the landfill, although it is currently in no danger, says IFC Director Witold Krajewski. Researchers continue to monitor the situation closely. IFC researchers are getting an up close and personal view of the smoke via a remote camera trained on the mobile weather radar unit as it was in the process of testing when the landfill fire broke out on Saturday. The camera was set up to watch how the mobile unit responds to remote commands. View the live feed here. The Iowa Flood Center (IFC) operates the radar units as a network providing high-resolution rainfall intensity data over the Clear Creek experimental watershed. The radar units are optimized for rainfall observations and help Iowa Flood Center researchers as they develop improved algorithms for determining precipitation. In addition to the landfill site, IFC radar units are stationed at the Iowa City Municipal Airport and the Eastern Iowa Airport. Photo courtesy of Aneta Goska. The IFC radars have polarimetric capabilities, which provide higher-quality data for determining rainfall quantities. The Center is one of only a few institutions nationwide operating a radar network with these capabilities. 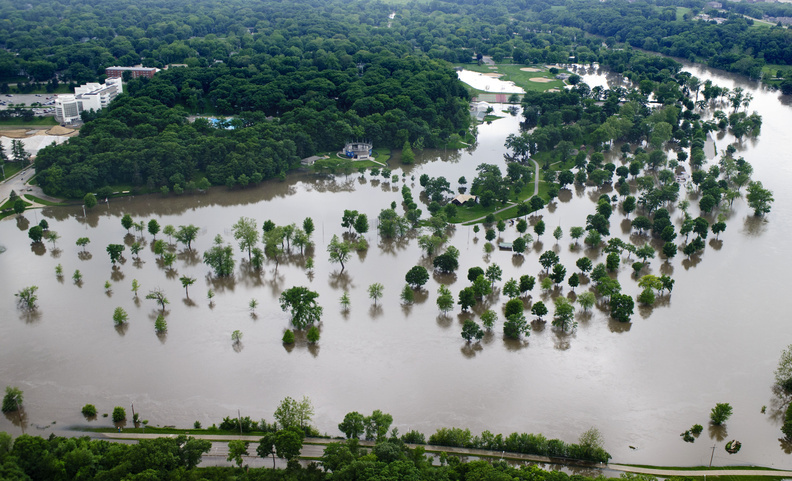 IFC researchers currently use radar data from National Weather Service radars to develop high-resolution precipitation maps for the Iowa Flood Information System. “We are one of very few groups with the expertise to do this,” says Krajewski. “Our way of displaying the data is unique.” The precipitation maps will not provide a forecast, but rather an almost real-time report of precipitation. When the fire at the landfill is extinguished, Krajewski says, IFC engineers will bring the radar back to campus for a thorough cleaning. To learn more about the Iowa Flood Center, visit www.iowafloodcenter.org. Predicting the impact of flooding in the past brought with it a lot of guesswork. Now predicting the impact of a flood may be able to be accomplished with a little more certainty thanks to the work of the Iowa Flood Center.